adidas Basketball might not be the choice basketball product for kids in the United States, but they are getting there right behind the top dogs: Nike & Brand Jordan. In fact, if Adidas gets the naming rights for the Chicago Bulls new practice facility opening up in 2 years right next to the United Center, you can count on adidas Basketball to be a more prominent player in that category and Kobe would've wished he had stayed with the three stripes. Staying faithful to the adidas Basketball team concept, adidas Basketball unveiled the “Bright Lights – Big City” Packs consisting of the adizero Crazy Light 2 and Top Ten 2000. Each model comes in their respective NBA team colors highlighted with reflective materials and contrast lacing. Top Ten brings back aggressive ’90s styling with wave-shaped tooling, extended herringbone traction and Feet You Wear tech, while CL 2 reps the latest in adidas footwear with lightweight performance, SPRINTWEB and SPRINTFRAME. 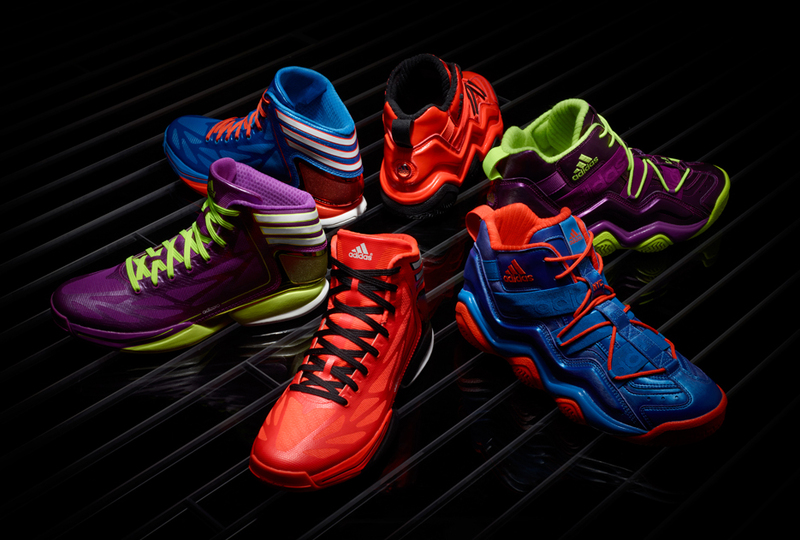 Look for the official release of December 12, 2012 at adidas.com.